Slow selling models rarely are given a second chance. When an automotive manufacturer has a dud on its hands, it usually cuts its losses and moves on to something else. Well, the Chevrolet Volt is not a dud, but it is a slow seller. At least compared to when GM’s initial sales projections were made. Volt sales never reached the 50,000 per year plateau GM set early on and this year the 2+2 plug-in front-wheel-drive electric vehicle is facing a 15 percent drop in sales over last year. Through October 2014, just 15,979 of its PHEVs have been sold and unless Chevrolet comes up with big incentives, the Volt will struggle to hit the 20,000 unit plateau. GM isn’t giving up on the Volt nor on its technology. In many ways, it is still a ground-breaking model, but in these days of declining gas prices, much more efficient gasoline-powered cars, and decent in-house competition from the Chevrolet Cruze, Volt sales have struggled. At some point in 2015 the next generation Chevrolet Volt will be released, giving this model a rare second chance to win new customers. 2015 Chevrolet Volt. A new model will soon arrive. GM has too much invested in its Voltec platform to simply give up. It is also politically expedient for the automaker to press forward — these days the powers that be are pushing vehicle electrification even as consumer interest is tepid at best. It is up to GM to find ways to sell the Volt, the Cadillac ELR and any other models it may yet develop based on that platform. What we know about the next generation Volt has gradually filtered its way to the media. Unlike some models that are super secret, GM understands that having an ally in the press can help its cause in telling the Volt’s story. It is a tricky relationship — not all reporters are supporters and the ones that realize that Volt expectations must be managed. The last thing the public wants to hear is a glowing report without substance. They’re also mindful that buying a Volt may never pay off, even with a $7,500 federal tax credit and other incentives. Now about the new model. Early on, reports had the Chevrolet Volt outfitted with a new, smaller gasoline engine or generator, to improve its overall mileage and to extend its range. That’s not going to happen or at least not that way. Instead, GM will replace the 1.4-liter four-cylinder with one displacing at 1.5 liters. Not a big move up, but a significant one as it will give this model a slight power boost and improve its overall fuel economy. The 1.5 liter motor is also part of a new engine family, one that will be composed of naturally-aspirated and turbocharged versions. You’ll see the engine in the Chevrolet Cruze and likely in the Buick Encore and other small GM models. One of the drawbacks for any PHEV is its electric range. The current model travels no more than 35 miles before the range extending generator kicks in. When active, the generator creates electricity and sends it to the electric motor to turn the front wheels. Thus, vehicle electrification is always “on” even if the engine is theoretically doing the work. The new model should see that range extended, with 50 miles the expected result. Revised lithium-ion batteries should store about 20 percent more electricity and come in 12 percent more efficient than the current battery system according to Edmunds. Other efficiencies will be gained by replacing the single electric motor with dual electric motors and using a lighter weight battery and drivetrain, what should knock 130 pounds off its current weight. 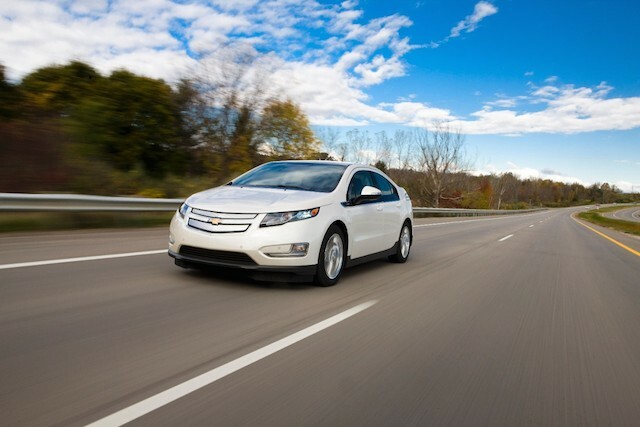 Importantly, GM’s engineers have promised that the second generation Chevrolet Volt will take regular grade gasoline. The current version requires premium grade gasoline, essentially adding 40 cents or more per gallon to the cost. Volt owners are already paying more for the vehicle; the premium surcharge hasn’t helped matters. We’ll get our first official preview of the 2016 Chevrolet Volt at the 2015 North American International Auto Show in Detroit this January. GM will reveal many of the details associated with the new model although pricing may not be announced until closer to its release date later in the year.